1) Improve bloodflow to the muscle. 2) Promote saturation of the muscles. The proven dosing of trademarked and study-proven ingredients in Vasky give you all you need to achieve this. With Vasky's incredible value, it can easily be stacked with your favorite preworkout to achieve pumps and gains beyond your imagination. Are you Vasky?" 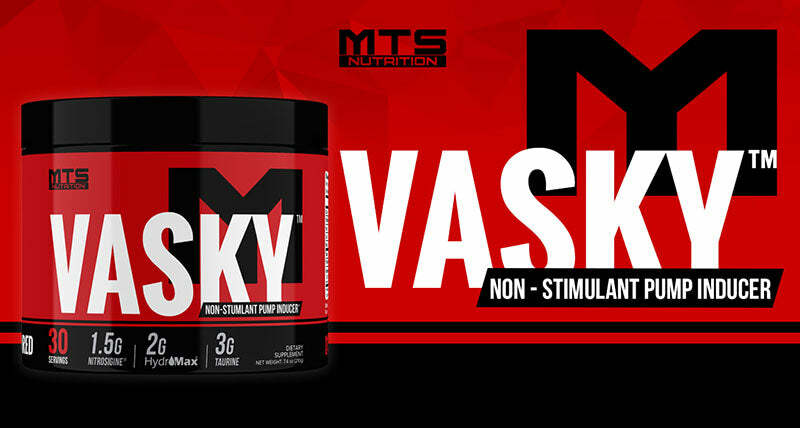 MTS Nutrition VASKY™ is the SCIENTIFICALLY-DOSED leader in non-stimulant pre-workout meant to be taken as a standalone or with your favorite stimulant based pre-workout such as MTS Nutrition CLASH® or Ruckus™. VASKY contains Nitrosigine™ which enhances nitric oxide for an extended period of time, along with HydroMax™ Glycerol which promotes hyper-saturation of the muscles. With Taurine, added for its positive performance and volumizing effects, VASKY is guaranteed to help you achieve the greatest pumps and best workouts you’ve EVER had! ONE SCOOP IS ALL YOU NEED! Being pumped beyond your wildest dreams... That's Not A Game! The body uses the amino acid arginine to fuel nitric oxide production. For years, it was believed that supplementing with free from L-Arginine would increase blood levels of the amino acid, leading to improved NO production and greater pumps. Unfortunately, arginine carries with it an extremely poor bioavailability, rendering it essentially useless for increasing NO production. Enter Nitrosigine, a “enhanced” form of arginine where the amino acid is bonded to silicate. Developed by Nutrition 21, Nitrosigine has been shown to elevate NO levels within 30 minutes of ingestion and keep levels elevated for up to six hours. With daily usage, Nitrosigine builds up your baseline NO levels and keeps them elevated for up to 14 days! Vasky includes the clinically backed dose of 1.5g of Nitrosigine, which has been shown to increase energy levels, muscle pumps, and recovery. Hydration is a critical component of optimal performance in and out of the gym. When adequately hydrated, you’re mentally and physically on top of your game. When you’re not, fatigue, both mentally and physically, rapidly set in. Found in vast quantities in the brain, heart, and skeletal muscles, taurine is a semi conditional that provides multiple benefits to the hard-training athlete. First and foremost, taurine functions as a cell volumizer, encouraging your muscles to absorb extra water, which leads to improved hydration, stamina, and muscle fullness. Since taurine is also present in the brain, it can enhance focus and reduce brain fatigue, helping you stay in the zone no matter how long you’re in the gym. An essential water-soluble vitamin, Vitamin C is most commonly associated with fighting the common cold. You might be surprised to learn it’s also a valuable performance enhancer and nitric oxide booster. Research has shown that the popular vitamin enhances nitric oxide synthesis, helping you look my vasky. On top of that, Vitamin C can also reduce fatigue and the rate of perceived exertion during exercise. "Great product that does what it claims! This pump is REAL!" "Best pump product on the market hands down!!!! Amazing pumps and vascularity it’s insane!" "Loving vasky, it definitely gives you a great pump and it mixes easy!" What can I stack with Vasky? Clash and Ruckus are both perfect for this, and if you need carbs go with Carb 10! I train at night, can I take Vasky Preworkout? YES! Vasky contains absolutely NO stimulants. 2. Yatabe Y, Miyakawa S, Ohmori H, Mishima H, Adachi T. Effects of taurine administration on exercise. Adv Exp Med Biol. 2009;643:245-252. 6. Harvey et. al. The effects of inositol-stabilized arginine silicate on cognitive function. Journal of the American College of Nutrition. 2015;34(6):544. 8. Rood-Ojalvo S, Sandler D, Veledar E, Komorowski J. The benefits of inositol-stabilized arginine silicate as a workout ingredient. Journal of the International Society of Sports Nutrition. 2015;12(Suppl 1):P14. doi:10.1186/1550-2783-12-S1-P14. As a dietary supplement, mix one scoop into your favorite stimulate-based pre-workout formula such as Clash. As a standalone, mix into 6 ounces of water or your favorite beverage. The Ingredients in Vasky can clump. This does NOT affect the quality of the supplement. Simply break up the clumps and enjoy the results! Read entire label prior to use. Not for use by individuals under the age of 18. Do not use if you are pregnant or nursing. Consult your physician prior to use if you are using any mediciations and/or have any medicial conditions. Discontinue use and call a physician or licensed qualified health care professional immediatlely if adverse reactions occur. Do not exceed recommended serving. Keep out of reach of children.